Last week Jane Hunt MW and myself attended the launch in London of the new WSET Level 3 Award in Wines. This event gathered together WSET Level 3 Certified Educators from across Europe and was our first chance to see what this revised course would offer. The Wine & Spirit Education Trust research and development team, led by Victoria Burt MW, have spent three years upgrading this qualification. The course benefits from entirely new student books, highly innovative course delivery, clear evolution of the WSET Systematic Approach to Tasting and improved teaching materials. This combination will re-enforce the position of this qualification as the benchmark at this level for international wine professionals. Another significant change is the loss of the Spirits content, it was felt that time during the course was best spent exploring in detail as many wine regions as possible. WSET Spirits qualifications will be available separately. Wine Academy Italia is delighted to offer its first WSET Level 3 Award in Wines this September at Cantine Lungarotti in Umbria. During the remainder of 2016 we will also be offering the new Level 3 courses at Argiolas Winery (Sardegna), Mastroberardino (Campania), Donnafugata (Sicilia) Agricola Masi (Verona) and in Rome. 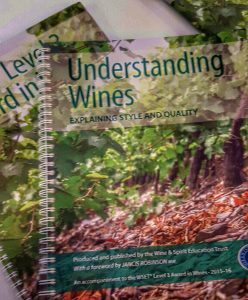 Just as we have in the past, the new Level 3 course will be taught over six days at our wonderful venues with two highly experienced tutor’s and a fantastic range of wine samples for our students to taste. There are still a few places remaining on our final WSET Level 3 Award in Wines & Spirits courses being held at Agricola Masi in May and Donnafugata in June. These give students a final chance to gain both the wines and spirits qualifications in one exam before we discontinue this course in July.